In this video we take a look at the Henry Big Boy in a somewhat odd caliber, .327 Federal Magnum. This caliber is basically a 32 S&W Long on steroids, with 115gr projectiles travelling at 1,500+ fps yielding over 600 ft/lbs of energy from a very light recoiling cartridge compared to 357 Magnum. Also, the smaller diameter allows for more capacity in a small frame revolver cylinder. In this Henry lever action, even the full power loads are like shooting gallery loads. Stay tuned, much more on the way. Over the years I've had nothing but positive experience with Walther firearms. The new Walther PPQ M2 Q4 TAC is not surprisingly any different. We recently got a couple Walther PPQ M2 Q4 TACs into Copper Custom so I wanted to take on to the range with a Trijicon RMR and test it out. Smith & Wesson's New M&P 2.0 Compact 9mm 3.6'' Pistol Review: Glock 19 Killer? I do some shooting with the new S&W M&P 2.0 Compact 9mm pistol with 3.6'' barrel, test the velocity of a couple self defense loads with it and the 4'' version, and go over the features of the pistol and what I think of it overall. The California DOJ had a massive data breach which exposed the sensitive personal information of firearms owners attempting to register their bullet buttoned rifles as assault weapons. The DOJ has also by not allowing exemptions to the registration deadline has potentially created criminals out of some service members and civilians who were unable to register ontime. Is there any practical difference between expensive and cheaper gun oil? For more than 25 years, I have explored the firearms lubricants industry hoping to find a gun oil that was clearly head and shoulders above the rest... however after much searching, I came to the opinion that there is no practically significant advantage to most of the fancy gun lubricants over the more ubiquitous brands. That being said, if one turns to some of the proprietary industrial lubricants being used in larger industries, such as manufacturing or the oil & gas industry, there are actually some products that stand apart. there are some industrial cutting oils out there that work very well in firearms and can reduce friction of metal parts by over 90%. Check it out! Talking about some of what it takes to get into the 6.5 Creedmoor and .224 Valkyrie. This video is based on what it takes to get into these calibers using the ar-15 and ar-10 platform. What magazines to use, bolts and bcg's. What barrels and lower parts kits etc. This video is intended for educational purposes only! Should Christians Really "Turn the other cheek," When Attacked? We take a close look at what Jesus really meant when He told His followers to turn the other cheek. I have heard over the years that shooting steel cased ammo in your handgun will always cause brass cased ammo to get stuck if you don't clean the gun first. This is in response to my Sig P365 video where I fired 50 rounds of steel, which failed to extract, then fired brassed cased ammo which also failed to extract. Some viewers said the steel cased ammo caused the failures. A mix of the HK VP9 and the HK P30SK, the VP9SK is a remarkable winner in the concealed carry world. * Be sure to join the web's ONLY 100% pro-gun social community, Gun District at GunDistrict.com. It's much like Facebook, but without the discrimination against gun owners. This week on The Legal Brief, Adam Kraut continues our trip around the Pacific Northwest and heads to Washington to take a look at the ballot initiative being challenged by the Second Amendment Foundation and Citizens Committee for the Right to Keep and Bear Arms. In this episode of TFBTV, James Reeves looks at the Inland Manufacturing M30P - a "Tactical M1 Carbine". While the M1 Carbine is roughly 90 years old, the M30P takes the proven M1 Carbine design and wraps it in the invincible Sage EBR chassis, which allows for easy optic and accessory mounting while free-floating the barrel. This version - the M30P - is legally a pistol as it uses a 12" barrel (which is threaded in 1/2"x28") and it is equipped with a Gearhead Works Tailhook. The folks at Silencer Shop and Bowers were kind enough to send along a Bowers VERS 9S for use as a suppressor in this video, and it performed perfectly in that role. So while this design is well thought out and very attractive, with an MSRP of over $1,700, is it worth it? See for yourself today on TFBTV. "The new Inland M30 Series is a collaboration between Inland Manufacturing and Sage International, Ltd. best known for their innovative EBR (Enhanced Battle Rifle) systems that are being used by military forces worldwide. Sage Enhanced Battle Rifle stock systems are precision machined from a solid billet of high strength aircraft grade aluminum and are finished with mil-spec hard anodizing. The M30-P is the Pistol variant of the new M30 series that includes the Gearhead Mod-2 Pistol Arm Brace"
Brought to you by Birchwood Casey and the TGC Patreon PATRIOTS! ● Mugs - Matt @glassymatt on Instagram! Should you get CCW insurance in case the worst should happen and you need to defend yourself with a gun? If so, which CCW insurance is the right call for you? In this video, Andrew Branca, the author of The Law of Self Defense answers these questions. Andrew Branca has been a lawyer for 25 years, a Master competitive shooter, a former student of mentee of Massad Ayoob, a renowned author, and hosts the Law of Self Defense Show. In this video we also compare the following insurance options: (1) CCW Safe Insurance, (2) USCCA Carry Insurance, and the Armed Citizen's Legal Defense Network Insurance. Additionally, we give mention to Carry Guard insurance. The FPC and several other Grun RIghts groups are suing the DOJ over the mishandling of the registration process which kept some people attempting to register their rifles from doing so by the July 1 deadline. Also the DOJ withdraws "Assault Weapon" ban regulations from OAL. Colt Cobra 38 Special Revolver "A Classic Reborn"! Colt Made the Cobra Line of Revolvers from 1950-1981. Now they are back and better than ever. Big thanks to Gun Pro deals for sending the Revolver and to Robbie Wheaton from Wheaton Arms for a Great Range Day! In this video, Mark from the C&Rsenal Anvil gunsmithing series joins us to discuss how to determine whether a particular firearm is needing to be conserved, restored or open to Bubbarizing and why. Stay tuned, much more on the way. Sig Sauer P320 Post Recall: What Did They Change And Is It Safe Now? I sent my P320 in to be fixed after the problems it had not being drop safe. Since then, I put just under 1k rounds through it and in this video I go over what they've changed and what I think of the pistol overall. EndoMag gets Mean, Not-So-Ideal Conceal, CZ leaks new P10's! - TGC News! This week on TGC News, Jon Patton talks about the EndoMag from Mean Arms, the Ideal Conceal Struggle Bus Journey and CZ leaks new P10's! - Check out MrGunsnGear's Instagram for his P10F images! This is a full review of the NEW Savage 110 Tactical with AccuFit Stock in .308 with a 24" barrel. This rifle features an adjustable comb and length of pull as well as the AccuTrigger with a fluted bull barrel and 20 MOA Picatinny Rail. Yesterday, Dealbook’s Andrew Ross Sorkin wrote a column discussing the Navajo Nation’s bid to buy firearms maker Remington, A Surprising Bid for Remington, and an Unsurprising Rejection— as a backdoor way of achieving some degree of gun control. There’s not been little additional original reporting on the issue– and that which has appeared, largely regurgitates aspects of Sorkin’s account. I’ve not managed to find a copy of the bid, so, unfortunately, my discussion must rely on Sorkin. Navajo Nation, which Sorkin describes as “one of the largest Native American tribes in the country with more than 350,000 members and land holdings of more than 27,000 square miles in Arizona, New Mexico and Utah” controls a $3.3 billion investment trust. I include a map here, as I don’t think many readers– US or otherwise– who aren’t already familiar with this part of the country grasp just how large the sovereign territory controlled by the tribe is (even though the extent of that geographic control isn’t really relevant to this discussion). 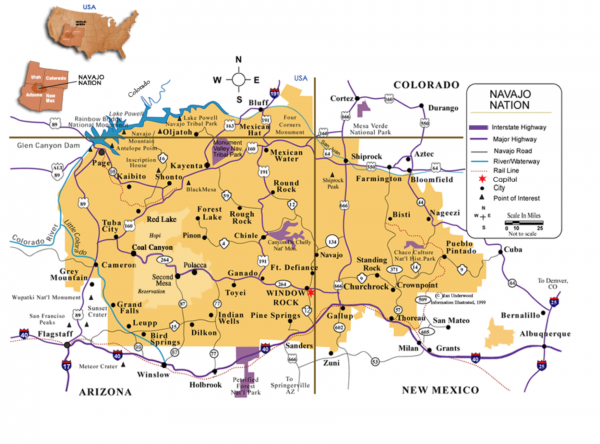 Source: The Navajo Nation Division of Economic Development, Where is the Navajo Nation? What is more germane is that despite the rise of a student-driven gun control movement– including large protests nationwide protests earlier this year– gun control remains stymied in the US– long after other countries have adopted drastic changes in the wake of massacres (e.g., Dunblane, Scotland, in 1996; Port Arthur, Tasmania, 1996). I note that although discussion of the Navajo Nation Remington bid has yet to achieve even limited traction in the US MSM– despite the DealBook assist– at least one foreign journalist appears regards these efforts as evidence of a slim wisp of gun control sanity (see this account in Les Echos, Pourquoi Navajo Nation n’a pas pu racheter Remington). It’s not yet clear at this point what might be next for Remington– nor is the reason the Navajo Nation bid was rejected. In the absence of any further information, it remains to be seen whether any further transformative bid along the lines Sorkin suggested in May might succeed and transform Remington’s business model. Today on The Legal Brief, Adam Kraut talks about how Cody Wilson and Defense Distributed brought the Department of State to their knees and reached an agreement allowing the distribution of files for 3D printed guns. Brought to you by Blue Alpha Gear and the TGC Patreon PATRIOTS! Roughly 1000 rounds later.. Some problems i had, and my final thoughts on this little carbine. If you value what we do at ASP, would you consider becoming an ASP Patron Member to support the work it takes to make the ASP Extra videos like this discussion with Terry Johnson about how your 911 call can get you sent to prison? https://get-asp.com/patron or https://get-asp.com/patron-annual gives the details and benefits. In this episode of TFBTV, James Reeves tells you what the 5 best autoloading handguns OF ALL TIME are. Well, technically, you told him when you participated in the 'March Gatness' tournament polls at www.gat.life this past spring (new polls coming next spring!) James takes the 5 most popular guns from that poll and gives you a little bit of history and a little bit of an explanation of their features and what made them groundbreaking. While each of these guns deserves its own video, James tries to compress all of this into a 20 minute video. Enjoy. Top inexpensive AR-15s to get with IV8888 and John Lovell of the Warrior Poet Society. Chad and Eric of the Iraqveteran8888 channel have a habit of torture testing guns to see which hold up the best. I was paricularly excited to get their opinions to this topic because I don't often use the entry-level, inexpensive AR-15s. The truth is that there are some great AR-15s out there that are tough and come without the big price tag. In this video we give special mention to the M&P Sport 2, the Savage AR-15, Palmetto State ar-15 to include their premium option, and CMMG AR-15s. MAC Vlog Episode 3: Why do I keep buying P365's? I've heard people say I'm buying P365's (on my 3rd one) because i'm "feigning indignation" or some other silliness. No, I have a very distinct reason for buying multiple P365's, VP9's, R51's, RP9's, etc. and I explain, what I thought should be obvious but apparently isn't, in this video. If you're easily offended, please pass this video by. If you're a fanboy of any of the above mentioned products or companies, please pass this video by. A federal appeals court ruled on Tuesday that the U.S. Constitution's Second Amendment protects the right to openly carry a gun in public for self-defense, rejecting a claim by Hawaii officials that the right only applies to guns kept at home. The ruling by a three-judge panel on the 9th U.S. Circuit Court of Appeals, makes the San Francisco-based court the sixth U.S. circuit court to interpret the Second Amendment this way and could set the issue on a path toward the U.S. Supreme Court, which has not taken up a major gun rights case since 2010. The extent of the right to gun ownership is one of the most hotly contested debates in the United States, where mass shootings have become almost commonplace. In a split two-to-three decision on Tuesday, the panel found Hawaii infringed on the rights of plaintiff George Young when it twice denied him a permit to carry a gun outside. "We do not take lightly the problem of gun violence," Judge Diarmuid O'Scannlain wrote in Tuesday's ruling. "But, for better or for worse, the Second Amendment does protect a right to carry a firearm in public for self-defense." The 9th Circuit had ruled in 2016 that the Second Amendment does not guarantee a right to carry concealed firearms in public in Peruta v. County of San Diego. The U.S. Supreme Court declined to rule on that decision last year. President Donald Trump, a vocal gun rights supporter, is seeking to fill a vacant Supreme Court seat and make the court more conservative, raising the prospect that it may take up more cases in coming years. Alan Beck, a lawyer for the plaintiff in Tuesday's ruling, said he believed the question about openly carrying firearms would eventually end up before the Supreme Court. "I think the Supreme Court is receptive to this," Beck said in a phone interview. Attorneys for the state of Hawaii were not immediately available for comment. Judge Richard Clifton dissented from Tuesday's ruling, saying the Second Amendment does not preclude the sort of licensing rules used in Hawaii and elsewhere. Laws on openly carrying firearms vary widely by state and type of gun. The most restrictive are California, which falls under the 9th Circuit's jurisdiction, Florida, Illinois and the District of Columbia, which generally prohibit people from openly carrying any sort of firearm, according to the Giffords Law Center to Prevent Gun Violence, a nonprofit policy organization that favors greater gun control. Hawaii is one of 15 states that requires a license or permit to openly carry a handgun, according to the center's data. In 2008, the U.S. Supreme Court ruled for the first time that the Second Amendment protects an individual right to keep guns at home for self-defense. The Second Amendment was adopted in 1789 and reads: "A well regulated Militia, being necessary to the security of a free State, the right of the people to keep and bear Arms, shall not be infringed." Ruger Stock VS MDT Chassis - Upgrade Worth the Money? This time on TGC, Jon and Ben head out to the range to test a giveaway Ruger American Predator in 6.5 Creedmoor in its stock form and compare the results against the groups the MDT Chassis. FN509 Tactical, Army’s M17 For Sale, 224 Valkyrie Issues - TGC News! This week on TGC News, the FN509 gets a Tactical upgrade, the Army's new P320 is for sale and SB Tactical teases a new side folding brace!